Most of us have the ability to work in different places these days. I am personally very mobile. I love all my little tools – I carry my Air, iPad and iPhone plus a few other bits whereever I go. Now, just because I can work anywhere does not mean that I always like to. Depends on what I need to get done. My home office space is my ideal working environment. This is the one spot I have invested the most time in making comfortable for me and as such, this is where I do my best work. For you, it may be your office at work. I had never given much thought to why I like this space the most..it seems obvious…but one item that makes this spot ideal: my desk phone. My desk phone is large, reliable and comfortable. It has an easy interface, great speakerphone and a good headset always attached. This communication device, sitting right next to my iMac, makes communication rich and easy. When I sit here – I can get anything done. Anything. 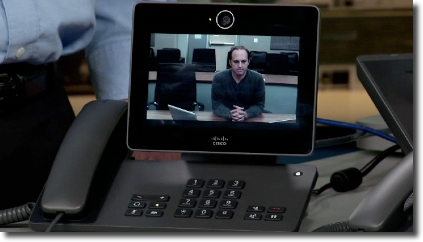 So as silly as it seemed when I first heard it, the idea that Cisco was investing in the deskphone, now makes sense. Mobile phones, tablets..these are all obvious, well worn markets with lots of people fighting for a toe-hold. The desk phone? How delightfully contrarian. Cisco is really good in the business space..selling to consumers…not so much. But the enteprise…at all levels…have very unique needs. Cisco’s move with the DX650 is brave, and based on what I have seen…really smart. Roberto De La Mora kicks off our main segment with Laura Powers hosting. I like that he wanted to address the whole Cius development thing head on. 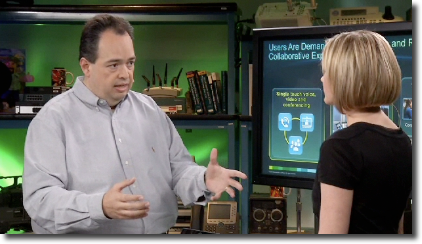 You can see Cius elements in the new DX650…especially what we learned..and I appreciate Roberto’s candor. We will always choose the best, and most reliable, device for the moment at hand. 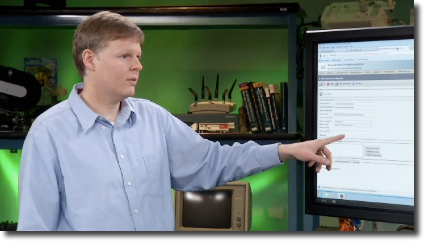 Kirk McNeill covers multi-user profiles, answer why there was such a minimilist apprach to the hardware and more. I really like the notion of the LOCK button. I have long been in the habit of triggering my screen lock when walking away from my computer. This stemmed from early years at Cisco where my engineer would punish me for leaving my laptop unsecured by sending out mass email with something embarrasing. (He actually did not need to be on my machine to ‘spoof’ my email…but I got the point). David Scott had us dialing out to another old friend of the show, Nathan Shaw. I was truly blown away at how well this worked. 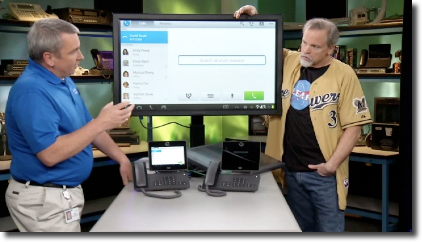 When you read about HD quality interop with telepresence, it may go right past you….when you actually see it…oh my. It made me salivate just a little bit. The presence aware speed dial and features that come smoothly with the touch screen and corporate directory integration jumped out here too. Jimmy Ray came in with his cynical (yet valuable) tone with David in part 2 here. This segment really shined in the area of ‘made for the enterprise.’ The VPN, pin lock requirement options and so much more. The fact that this device could be a hub for your video surviallance monitoring (or esclation point) seemed like a great idea. 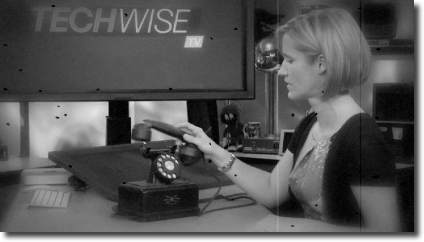 If you are not familiar with what Cisco has done with Video Surveillance/Video Intelligence, watch episode 27! We met Larry Michalewicz back whenwe were doing the Cius show and I am so glad that Cisco is still taking advantage of his talents. His perspective on the flexibility offered by this phone with the strength of WHY it can do what it does…makes it all very valuable. 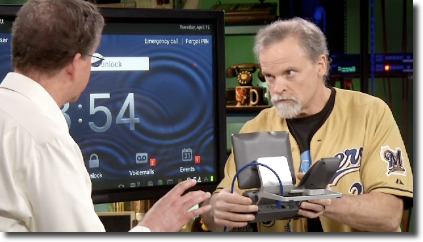 In fact, Larry did one of Jimmy Ray’s workshops as a follow up last time, and to prove how easy the programming here can be…he wrote an Android App for TechWiseTV live, in front of everybody…that continues to get thousands of downloads. This was a fun show to do. I hope both the fun and the value of the technology has come across here. Let us know if you have questions or ideas of course!